A genuine $2 Federal Reserve Note that is selectively colorized to enhance the design. One of America’s greatest screen legends, John Wayne – known simply as “Duke” to his fans – became a symbol of American values and epitomized the image of the rugged Western hero. After appearing in dozens of movies in the 1920’s and 1930’s, Wayne became a star in 1939 for his role as Ringo Kid in Stagecoach. Over the next three-and-a-half decades, he starred in more than 90 movies and developed into one of the greatest box-office icons of his era. In most of his movies, he was cast as the hero in Westerns and war epics. Wayne’s greatest role was Rooster Cogburn in True Grit, for which he won the 1970 Academy Award for Best Actor. He was also awarded the Congressional Gold Medal and the Presidential Medal of Freedom. The colorization on the $2 bill is precision-printed to the highest quality using a revolutionary new technique. The design is officially authorized, so this is a genuine and official John Wayne collectible. The $2 bill is a genuine legal tender U.S. bank note. It was originally issued as part of the 1976 bicentennial celebration for the 200th anniversary of the Declaration of Independence. 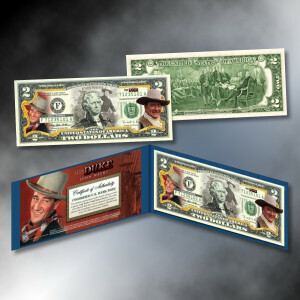 In addition to John Wayne, the front features the portrait of Thomas Jefferson; the back depicts the painting “The Signing of the Declaration of Independence” by John Trumbull. The bill is in Crisp Uncirculated condition and remains U.S. legal tender. The colorization is privately applied, since the U.S. government does not have the capacity to create enhanced notes. The bill comes with a custom folio that preserves its condition and allows it to be safely displayed.